Many Northerners saw abolitionists as dangerous radicals. They feared that abolitionist attacks on the South threatened the unity of the nation under the Constitution and challenged the racial superiority of white people. They also were convinced that ending slavery would endanger American commercial prosperity, which was based on Northern manufacturing and Southern cotton. 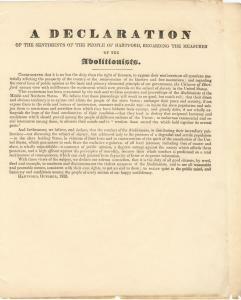 This anti−abolitionist broadside, published by a number of influential citizens of the Connecticut city of Hartford, expressed those views. A DECLARATION OF THE SENTIMENTS OF THE PEOPLE OF HARTFORD, REGARDING THE MEASURES OF THE ABOLITIONISTS. CONSIDERING that it is no less the duty than the right of freemen, to express their sentiments on all questions materially affecting the prosperity of the country or the maintenance of its liberties and free institutions; and regarding the moral force of public opinion as the basis and primary elemental principle of our government, the Citizens of Hartford cannot view with indifference the excitement which now prevails on the subject of slavery in the United States. And furthermore, we believe, and declare, that the conduct of the Abolitionists, in distributing their incendiary publications—not discussing the subject of slavery, but addressed only to the passions of a degraded and servile population—in the slave holding States, in violation of their laws and in contravention of the spirit of the constitution of the United States, which guarantees to each State the exclusive regulation of all local interests, including that of master and slave, is wholly unjustifiable—a contempt of public opinion, a flagrant outrage against the society which affords them protection, and a high offense against the principles of morality, because their whole conduct is predicated on a total recklessness of consequences, which can only proceed from depravity of heart or desperate infatuation. With these views of the subject, we declare our solemn conviction, that it is the duty of all good citizens, by word, deed and example, to condemn and discountenance the violent measures of the Abolitionists, and to use all reasonable and peaceable means, consistent with their own rights, to put an end to them; to restore quiet to the public mind, and harmony and confidence among the people of every section of our happy confederacy.